Last year, a beautiful Pit Bull named Oreo was thrown from the roof of a six-story building – and survived. He endured broken bones, psychological trauma, and incredible pain only to be euthanized after failing a temperament test. Today, Lawrence Mick will stand trial in a Lucas County, Ohio, court on charges of animal cruelty. 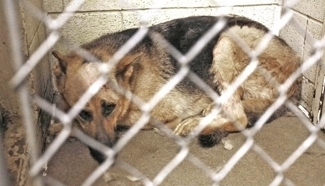 Earlier this month, Mick and friend Adam Collins allegedly locked his German Shepherd in a cage and with a handgun at point blank range, shot the dog in his head, in his chest, and in his neck – a total of six times. The trapped dog howled in pain, his cries so disturbing, a neighbor finally called 911. Amazingly, Sarge survived. He’s currently in municipal custody, recovering at the Lucas County shelter. But the dog, who has a bite history (shocking! his owners sound so loving…), is in danger of being euthanized. Dog warden Julie Lyle explains that if Sarge is assessed as “aggressive,” the shelter will not adopt him out directly. In the meantime, several individuals have come forward to say they’re willing to give this dog a chance, including Dayton-area resident Alana Yoder, whose husband trains K-9 dogs. She’s promised to not only care for Sarge on their 15-acre homestead, but to accept any liability for his behavior. Warden Julie Lyle, however, is not budging. That’s where we, the public, come in. Ohioans: Please contact your local rescue groups and sanctuaries and request their intervention. If one of these organizations can work with Lucas County to gain custody of Sarge, he can then be adopted to a family with the experience and compassion required in such a situation. Please don’t get me wrong: I understand that the average person is not equipped to handle or care for a potentially fractious dog. In this case, however, there are people in the local community with both the professional training and the physical resources to give this animal the life he desperately deserves. For those outside of the area, use this link to contact dog warden Julie Lyle . Respectfully encourage her to work with local rescue groups so that Sarge may live to see health and happiness. We owe it to Sarge. We owed it to Oreo, but didn’t deliver.